MOSCOW, September 17. /TASS/. Russia can become the main exporter of gas to China after a decision on the ‘western route’, the volume of supplies can reach 80 bln cubic meters a year, according to Director of the National Energy Administration of China Nur Bekri. "We continue consultations and expect that we will get 30 bln cubic meters from the ‘western route’. If we can agree on the ‘western route’, then it will be more than 80 bln cubic meters (for all supply routes, including LNG - TASS). 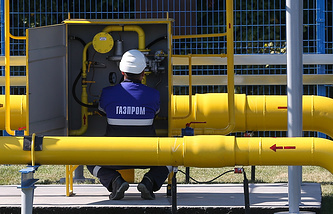 This means that Russia will take the first place among gas suppliers to China," he said. Contract for the supply of Russian gas from the Far East to China might be signed in the first half of 2019, he added. "I look forward to a speedy signing between the companies. The first half of next year would be good," he said. The volume of gas supplies from Russia to China along the ‘eastern route’ may amount to 5-10 bln cubic meters per year, he said. "According to the preliminary results of the talks between the two countries, the volume will range from 5 to 10 bln cubic meters," he said. According to him, contract for the supply of Russian gas from the Far East to China might be signed in the first half of 2019. "I look forward to a speedy signing between the companies. The first half of next year would be good," he said. Earlier, Gazprom CEO Alexey Miller and Vice-Premier of the State Council of China Han Zheng discussed the project of gas supplies from the Russian Far East and negotiations on the ‘western route’. Earlier Russia’s Energy Minister Alexander Novak said that Russia and China have agreed to get approval for gas supplies via the Power of Siberia’s ‘western route’ in the shortest possible time. Currently, Gazprom is building the Power of Siberia gas pipeline, which will pump natural gas from the giant Chayanda oil and gas condensate deposit in Yakutia and the Kovykta gas condensate field in the Irkutsk Region in Eastern Siberia to deliver gas to the domestic market (via Khabarovsk to Vladivostok) and further on for exports to China. The so-called ‘eastern route’ includes supplies of 38 bln cubic meters of natural gas to China’s eastern regions annually within 30 years to be launched in end-2019. In May 2014, Gazprom and China National Petroleum Corporation (CNPC) signed a respective sales and purchase agreement. In 2015, Gazprom and CNPC signed an agreement on the basic conditions for pipeline gas supplies from Western Siberia to China via the ‘western route’. Initially, it was planned to supply 30 bln cubic meters of gas per year to China. Also in 2015, Gazprom and CNPC signed a memorandum of understanding on the project of pipeline supplies of natural gas to China from the Russian Far East. In December 2017, Gazprom and CNPC signed an agreement on the basic terms for the supply of natural gas from the Russian Far East to China.